Model PAS-01-4, Multi Chamber Alpha Spectrometer System is a versatile indigenously developed four channel Alpha Spectrometer System for simultaneous measuring of four low activity samples that decay by Alpha-particle emission. Model PAS-01-4 is an integrated four spectrometers of 3 width standard NIM modules. Each module includes Vacuum Chamber, built in digital vacuum gauge, Passivated Ion-Implanted Silicon Detector (active area 450 mm2), Charge Sensitive Preamplifier, Spectroscopy Amplifier, Detector Bias Supply and 2048 channel MCA with Ethernet interface to standard PC or laptop. Model PAS-01-4, Multi Chamber Alpha Spectrometer System is supplied with Four Alpha Spectrometer Modules, Mains operated 12 width NIM BIN with low ripple Power Supply, 150 LPM Vacuum Pump, 4 way vacuum manifold, 8 way Ethernet Switch to connect four Alpha Spectrometer Modules to communicate with standard PC / Laptop via Ethernet. The Control (PUMP, HOLD, and VENT) provided on front panel of Alpha Spectrometer module makes it easy to insert, analyze and remove samples. 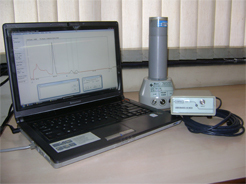 Multichannel Alpha Spectrometer software package is provided to set/display various operating parameters of each Alpha Spectrometer Modules and for Data Acquisition/processing/display, Energy Calibration, ROI selection, Area Calculation, peak information, FWHM calculations, data Storage and report generation, etc. along with the system. Once operating parameters have been set, the data acquisition can continue off-line. 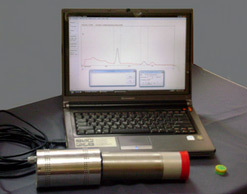 Alpha Spectrometer is also available as Single Chamber system. Sample Trays : Solid Brass with Nickel plated Slide-in sample trays to accommodate samples of 13 mm to 51 mm dia. Model GSpec is a versatile compact USB based 1024 channel Multi Channel Analyzer based Gamma Spectroscopy System. GSpec is designed and manufactured indigenously by Para Electronics for 14 pin NaI(Tl) Scintillation Detector based Gamma Spectroscopy. GSpec is powered by USB interface and includes preamplifier, Spectroscopy Amplifier, High Voltage supply for detector. It also contains 1024 channel 48 MHz Wilkinson ADC with Silab Microcontroller for USB interface with PC for spectrum acquisition and data processing. Data acquisition software is loaded on PC / Laptop and provides spectrum acquisition and display, spectrum analysis software for energy calibration, ROI selection, area calculation, peak search, peak information, spectrum smoothing and spectrum data storage on PC hard disk. High voltage supply necessary to operate scintillation detector is software programmable from 0 to 1200 volts in 256 steps. Spectroscopy amplifier gain is settable through PC. Optional : GPS co-ordinates can be displayed and stored along with spectrum data, time stamp if GPS module is connected. GSpec SA is a 1K Multichannel Analyzer with HV Supply and Spectroscopy Amplifier. 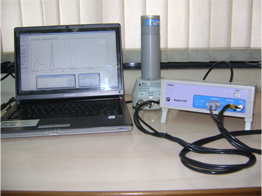 It is a mains operated instrument for NaI(Tl) detector based spectroscopy. GSpec SA along with NaI(Tl) detector of Customer’s choice and Preamplifier (NETS-0M) form a complete Spectroscopy System. The whole setup has a resolution of around 7%. It is suitable for applications where low resolution of nuclides is acceptable. GSpec SA is ideally suited for Nuclear Spectroscopy experiments carried out at Universities, Environmental Survey Labs and Health Physics Units of Nuclear Power Plants and Chemical Control Labs. GSpec contains 1024 channel 48 MHz Wilkinson ADC with Silab Microcontroller for USB interface with PC for spectrum acquisition and data processing. 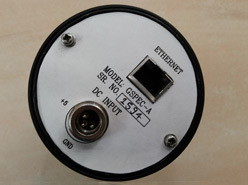 Dimensions : 225mm X 200mm X 70mm Comptec box. GSpec-ADC is a versatile compact USB based 1024 channel Multi Channel Analyzer GSpec-ADC is powered by USB interface It contains 1024 channel 48 MHz Wilkinson ADC with Silab Microcontroller for USB interface with PC for spectrum acquisition and data processing. Model GSPEC-A is a versatile compact 1024 channel Multichannel Analyzer based Gamma Spectroscopy system. GSPEC-A is designed and manufactured indigenously by Para Electronics Mfg. Division of Electronic Enterprises (I) Pvt Ltd for 14 pin NaI(Tl) Scintillation Detector based Gamma Spectroscopy. GSPEC-A requires +5VDC,1A external supply. It includes preamplifier, spectroscopy amplifier, high voltage power supply for the detector and 1024 channel, 48 MHz Wilkinson ADC with SiLab microcontroller for ethernet interface with PC for spectrum acquisition and data processing. High voltage supply necessary to operate scintillation detector is software programmable from 0 to 1200 volts in 256 steps. Spectroscopy amplifier gain is settable through PC. The whole setup has a resolution of around 7% or better with NaI(Tl) detector. GSPEC-A is ideally suited for Nuclear Spectroscopy experiments carried out at Universities, Environmental Survey Labs and Health Physics Units of Nuclear Power Plants and Chemical Control Labs. 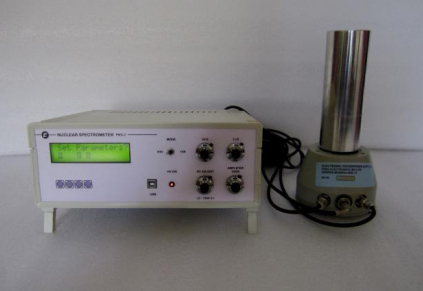 Para Nuclear Spectrometer Model PNS-2 is a Si-lab micro-controller based, stand alone, Mains operated instrument for NaI(Tl) detector based Gamma Ray Spectroscopy. PNS-2, along with NaI(Tl) detector of customer’s choice & Model NETS-0, PMT base preamplifier form a complete spectrometry system. This system is suitable for experiments related to absorption studies, half life measurements. This set up is very useful for gross Gamma counting of environmental samples, with appropriate detector. PNS-2 contains Spectroscopy Amplifier, SCA, HV supply for detector, power supply for preamplifier and micro based scalar / timer. 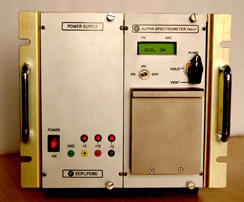 PNS-2, in its standard configuration, is supplied as preset timer. PNS-2 can store 1000 readings in a non-volatile memory for data logging. These readings can be downloaded to PC via USB interface and printed if required. These readings can also be read on LCD display after the counting experiment. PNS-2 is ideally suited for Nuclear Counting Experiments carried out in University and colleges. It is also useful for radiation counting for health physics applications in radioisotope laboratories, nuclear reactors, nuclear power plants, environmental survey labs, etc. NaI(Tl) Detector, PMT based Preamplifier, Lead shield around the NaI(Tl) Detector are supplied as an optional accessories for PNS-2. Depending on the application detector sixe and suitable shielding requirements can be configured. Model NETS-0 MHC, has a voltage divider, HV supply and preamplifier with cable driver output stage. It has a PMT base socket in which detector can be directly plugged. The output stage is capable of driving signal through a standard coaxial cable up to a maximum length of 100 meters. This unit requires ±15VDC or ±12VDC power. HV supply 1000V @ 1mA max required for PMT detectors, is generated internally. Stainless Steel weatherproof enclosure is optionally available for Detector and NETS-0 MHCL assembly. Output Impedance : 50 ohms. H.V. Monitor : 0 to +5 V output proportional to H.V. NETS-0 is a preamplifier for Photo Multiplier Tubes with 12 or 14 pin base. 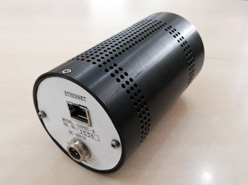 NETS-0 is compatible with standard Photo Multiplier tubes. No gain adjusment . Connectors are provided for HV supply, Signal and DC power. NETS-0 is available with two types of packaging: In-line and Base Stand.